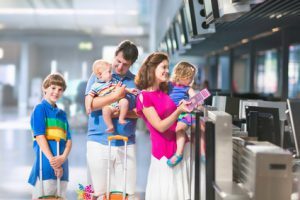 Keeping up with the constant changes in airport security, airline baggage rules, and even in the kinds of items that are prohibited from airline flights is important for any airline traveler. It’s also important to take precautions to ensure your safety before and during air travel. Most airliner accidents happen during the takeoff, climb, descent, and landing phase of flight, so the easiest way to reduce your chance of getting in an accident is to take fewer flights. If you have a choice, and there isn’t much difference in price, flying nonstop would not only reduce exposure to the most accident prone phases of flight, but it will probably take quite a bit of time off your trip too. Currently, aircraft with more than 30 passenger seats were all designed and certified under the strictest regulations. Also, in the unlikely event of a serious accident, larger aircraft provide a better opportunity for passenger survival. Although the information seems repetitious, the locations of the closest emergency exits may be different depending on the aircraft that you fly on and seat you are in. Some passenger safety briefings include a few words about the position to take in an emergency landing. If you have been injured on board an airplane or in an airport, we can evaluate if your rights have been violated and if you may seek compensation for your injury. Contact us.